You want to be the woman God has called you to be but… your health is holding you back. You’re ready to lose weight, to be vibrant and strong so you can do great things for God but… you don’t know how to get there. You want to know what the Bible says about food but… you’re looking for more than a food list. The Bible contains everything we need for life and godliness, including how and what we eat. While there is no “diet,” you will find principles that set the stage for great physical and spiritual health. Through the Word of God and these Bible verses about food, you will learn how to care for your body and, most importantly, your heart. Jesus had just endured 40 days of fasting in the desert and now He has found himself being tempted by the devil. The first enticement was that of Eve– to satisfy His appetite outside of the will of God. But, Jesus knew where true life and satisfaction were: in the Word of God. No matter what a diet tells you to eat or not to eat, there is only one “food” that can fill your every craving. Eating less becomes easier when our spirits are filled with Christ. 2. 1 Corinthians 6:12 (NLT) You say, “I am allowed to do anything”—but not everything is good for you. And even though “I am allowed to do anything,” I must not become a slave to anything. Diets preach “good” and “bad” foods but God tells us that ALL food is acceptable. However, just because something is allowed does not mean that it is good for us. Diets cannot reign in our hearts. Rather than using a food plan to tell you what to eat, prayerfully ask your Heavenly Father what He would have for you. Then your body, mind, and spirit will be their best! RELATED POST: What is a Biblical Eating Plan? The fastest way to increase your desire for a certain food is to make it “off limits.” In fact, off-limit foods can consume our thoughts when we are on a diet. If food rules are causing you to spend your precious energy on things that are truly not that important to you, then consider how you can shift your focus to the things of God. “I was so bad yesterday, I ate (fill in the blank).” Have you ever felt like a criminal for eating something you weren’t supposed to? Is unhealthy snacking your arch nemesis? Those of us who have been stuck in the diet cycle can start to measure the value of our days and ourselves based on what we eat. This is NOT how God does it. Rather, by examining our hearts we can change from the inside out, as a clean heart will lead to God-glorifying food choices. 5. Matthew 6:25-27 (ESV) “Therefore I tell you, do not be anxious about your life, what you will eat or what you will drink, nor about your body, what you will put on. Is not life more than food, and the body more than clothing? Look at the birds of the air: they neither sow nor reap nor gather into barns, and yet your heavenly Father feeds them. Are you not of more value than they? And which of you by being anxious can add a single hour to his span of life? Making sure we are fed is NOT our job. When we put God first, He will provide for our needs. There is no point in being anxious about your diet when He can see the big picture. Rather than stressing over a food plan, pray for His will and follow His peace. After all, you are more valuable than anything in this world to Him. 6. Deuteronomy 8:10 (NLT) When you have eaten your fill, be sure to praise the Lord your God for the good land he has given you. When diets dictate our portion sizes, those tiny plates can be painfully unsatisfying, both physically and mentally. In fact, feeling deprived can feel like a constant state. How much easier would it be to walk away from the table if you ended your meal by praising Him for all He has given you. If we are accustomed to overeating, then we may often long for more than we need. But when gratitude takes center stage– walking away from the table is much easier. 7. John 6:35 (ESV) Jesus said to them, “I am the bread of life; whoever comes to me shall not hunger, and whoever believes in me shall never thirst. I find it humorous in the age of carbophobia that in this scripture about food, Jesus calls Himself the bread of life. Diets that ban bread cause us to long for it with even greater desire. But there is One who can satisfy us even more than a freshly baked loaf. The question is, will you let Him? Only by eating The Bread through spending time in His Word, communicating in prayer, and just hanging in your daily life, can you find that true satiety. 8. 1 Corinthians 8:8 (ESV) Food will not commend us to God. We are no worse off if we do not eat, and no better off if we do. One of the best things you can do for your life and diet is to stop equating your value with your performance. You will never, ever follow an eating plan perfectly and to expect yourself to do so is to set yourself up for disappointment. Grace is the antidote to the yo-yo. When you fall down, when you slip up, when you decide to eat that second donut even though you know it’s a really bad idea, God is still there and He still loves you to bits. 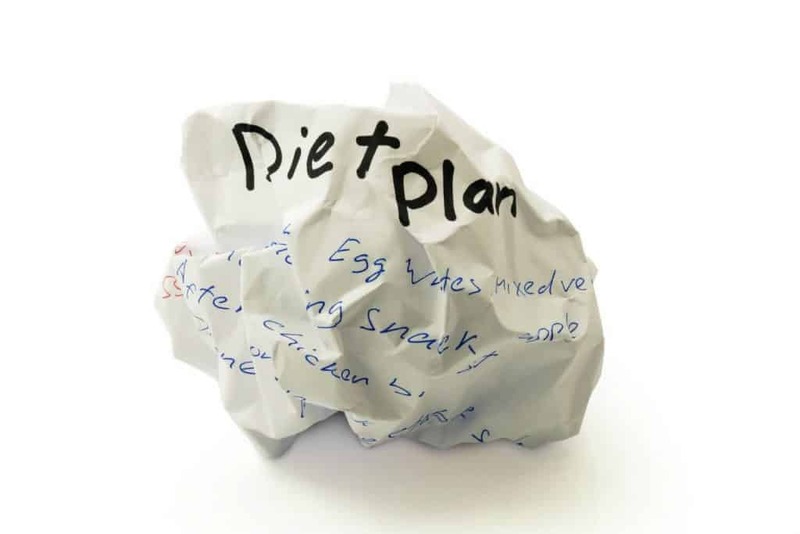 Stop the cycle, ditch diet perfectionism and jumpstart your progress! God has explicitly told us that there are no “off limits” foods. And while you may choose not to eat certain foods, it is not our place to judge others for their food choices. If you find yourself grading plates, turn your gaze from horizontal to vertical. All food is good but it all may not be good for you. 10. John 4:32-34 (ESV) But he said to them, “I have food to eat that you do not know about.” So the disciples said to one another, “Has anyone brought him something to eat?” Jesus said to them, “My food is to do the will of him who sent me and to accomplish his work. How would our lives change if we put doing God’s will above all else (especially food)? If we can see our bodily appetites as temporary, the urgency to meet those needs fades in the light of eternal purpose. Now, I am not at all suggesting that we arbitrarily go without food but that we prioritize real food. How can we do that? Consider giving up one thing for Him and put your affection where your mouth is! Now that you have some great Bible verses about food to chew on, what’s next? It’s time to put these truths to work! Review the Bible verses about food and choose ONE to study and meditate upon. Follow your gut here (the voice of the Holy Spirit). On the top of the paper, write the scripture about food. Read the surrounding verses for context. Review the verse in another version or look up any words you would like clarity on. Summarize the verse: What is the main message God has for you? Write down how this message is different from how you think, feel, and act now. Determine ONE way you can adjust your thoughts, feelings, and actions to line up with the Word of God. Jot down an Action Plan for how you will put that verse into action TODAY. 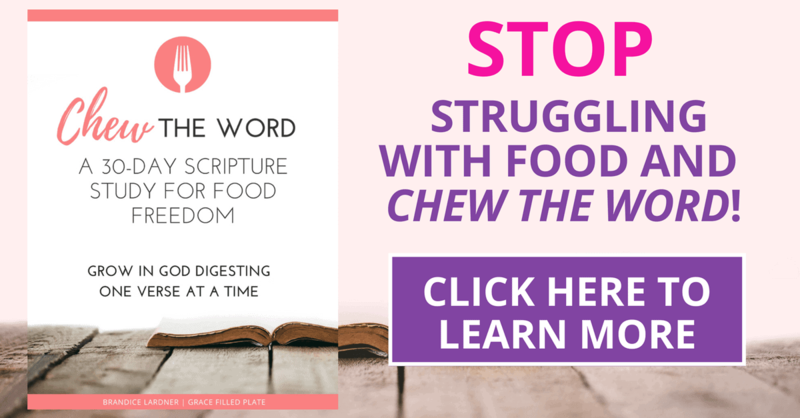 If you enjoyed this method of study and you would like to find more personal applications from the Bible for your health and fitness, check out Chew the Word, a 6-week scripture study. 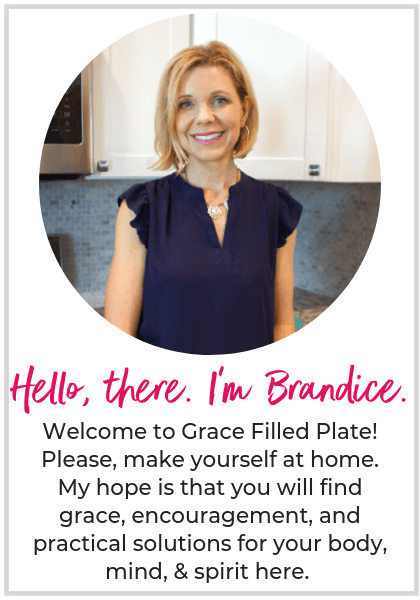 Brandice, I came across your blog on Pinterest and I am so glad that I did. I have been battling with diets and what is considered healthy for so long. I have been praying for God to help me overcome my obsession with my weight and the scale. I am trying so hard to think positively and find my worth in Him, but some days Satan pushes really hard, and the negative thoughts return. This post has spoken to me so much and I can not wait to read more. Thank you so much for sharing. I also stumbled across your blog via Pinterest and I’m so glad I did! I love it and can’t wait to implement the suggestions in my life. I was looking up one of the verses above, and I wanted to let you know the reference is wrong for number 4. The verses are in Mark. I love that Jesus said all foods are clean. And several years ago I discovered 1 Corinthians 6:12 which I also love. Thank you for the work you put into this for our benefit. I’m looking forward to seeing more!